If you're researching your ancestors or are interested in local history, marriage records are a useful tool. They contain the names of the bride and groom, their parents, the date and place of the marriage and often their address and hometown. In North Carolina there are many ways to access these records without having to pay a fee. Check the date of the marriage you are looking for. 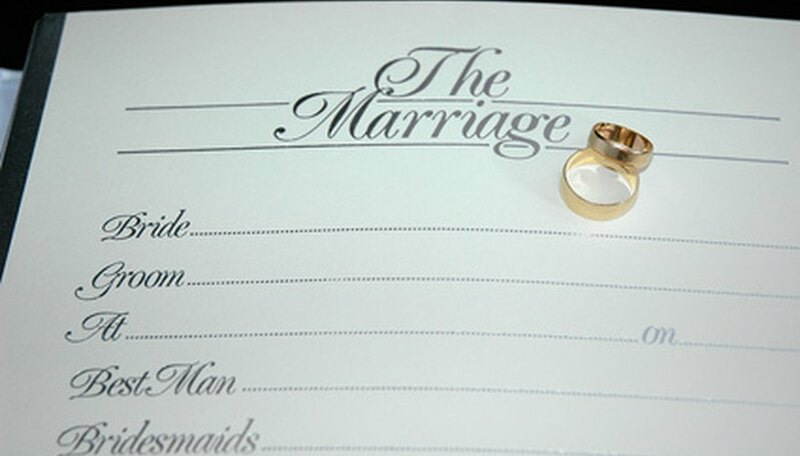 From 1868, North Carolina marriages were recorded with the Register of Deeds. As marriages registered before 1868 could be solemnized by any authority, it may be more difficult to locate the records and you will need to contact the county clerk. Visit the North Carolina Vital Records Office. You can go in person to their office in Raleigh or via their website. They hold all the state marriage records and searching their database is free. Be aware that ordering a certificate of marriage will incur a fee. Check newspaper archives. Newspapers often publish marriage announcements and include information on the bride and groom and the date and place of the marriage. The archives are held at the North Carolina State Library where they can be viewed on microfiche for free; they are also available online. There are websites that allow you to search for marriage records for free. Knowing the names of the bride and groom and their county in which they were married will make it easier to find the record you are looking for. Many sites allow you to search their databases for free but may charge you for ordering a marriage certificate. Always read the small print first.